Does everyone find this as annoying as I do? When I call one of my kids on their cell phone and then ask to speak with the other the conversation tends to go like this. Can't you call her on her phone? Is she not in the room with you, I ask. She is, she is sitting right next to me but I am watching Grey's on mine. Aaaargh!!! Drives me nuts. I consider myself to be forward thinking, I am not stuck in the past, maybe a little bit, or too nostalgic. I have come to embrace today's digital world to the fullest. I no longer have a land line and only use my cell phone. I am blogging and use the more mainstream social media. I don't use many of the social sharing apps that my kids use and truthfully don't quite understand the need for the constant sharing and updating but I have come to accommodate that it is a part of their lives and here to stay. I try to educate myself with most of these apps so I can continue to help raise my kids as good digital citizens. I talk with them about Snapchat (the older one has it), Yik Yak (I hope they never use it), we discuss online dating sites such as Tinder (no comment) and texting in general. So, here I am, open-minded and have learned to tolerate their choices in music and clothes. While I may go on ad nauseam about how great my music still is, I have to confess, that rolling down the car windows, singing the latest T Swift song at the top of our lungs with my kids is kinda fun. Unlike my father, who refused to give up his rotary dial phone, thought Elvis was a hooligan and still calls AAA for maps and directions when he is going on a road trip. I try to stay one step ahead or at least toeing the line with my kids. I get the lol's, the omg's, the fomo and bae and have promised to never use them, which I am pretty happy to oblige. But, much to Juliette and Lila's embarrassment and constant heckling there are parts of me that are stuck in the 70's and 80's and always will. Most notably a part of my vocabulary. Lila, my youngest was super excited for the mail to be delivered this weekend. She and her mom had ordered her first bras and she was awaiting delivery . After constantly checking the tracking number, it finally said it was delivered. A bright pink sports bra for her to wear while riding. She could not have been more adorable with her excitement to try it on and her hint of embarrassment as she paraded around the house to show me. I told her it was the cutest jog bra I had ever seen. As I kept referring to it as a jog bra there was a chorus of moans and groans and stop calling it that, its a sports bra. Part of me keeps saying jog bra to irk them but truthfully I cant seem to call it anything else. This is usually followed up with a chorus of "and stop calling it long underwear!" It is long underwear, I respond. Usually followed with an EEEWWWW! !, stop calling it that. How about base layers, I ask. No, just call it Under Armour. That doesn't make sense, I respond, that is a company that makes all kinds of athletic clothing. This generally goes on and on for a while, with all of us knowing that I will always call it long underwear, unless of course it is for cycling, then I call it a base layer. What we all can agree on is how scrumptious crêpes are for breakfast. While we may not agree with what deliciousness to fill them, we definitely agree that a day that starts off with one is going to be a great day. Crêpes seem to play a big part in our food conversation. Often after a morning of riding I will take them for crêpes to the Stockton Market, a wonderful indoor food market, open on weekends, with local purveyors and artisans, just across the Delaware River in NJ. 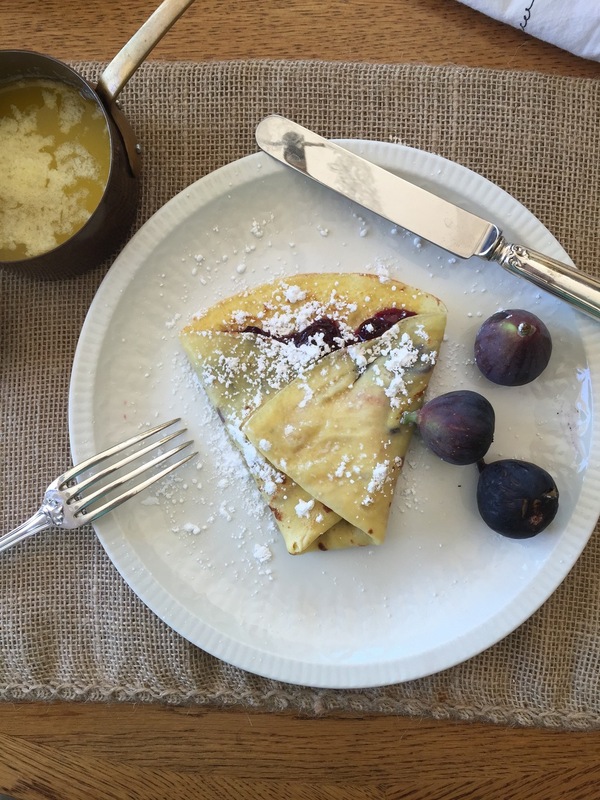 We spend the winter months talking and salivating about the crêpes down in Wellington, FL at the Winter Equestrian Festival, where the girls spend their winter vacation riding, showing and eating crêpes every afternoon. They always go for the Nutella crêpe and occasionally maple cream. In Wellington I never pass on the sauteed apples and at the Stockton Market, truth be told, I pass on the crêpe and head straight for More Than Q BBQ for their brisket sandwich. Insert the proud papa paragraph and weekend daddy-ism, for which I have Ace Greenberg to thank and with whom I worked for many years. One of his many sayings was "the more you give, the more you get", and I can still hear him saying it with his gruff no nonsense trading floor voice. I believe wholeheartedly in that mantra, words so simple and right to the point. It has served me well in my life and I have tried to pass that on to Juliette and Lila. I usually say it related to their sharing with each other and not charity but you have to start somewhere. This past Saturday, Juliette volunteered at Special Equestrians in Warrington, PA. She was very nervous when I dropped her off to start her three hour shift. She had been to a volunteer orientation earlier in the summer but didn't really know what to expect. I arrived later that afternoon to find her leading a student around on a horse in the indoor ring. She was smiling, as was the young man sitting a top the horse. As we drove home, she told me how much she enjoyed the experience, how she felt a personal connection to the students and how she was able to help others enjoy a sport for which she is so passionate and in which she has been very fortunate. I nodded, gave her a pat on the leg and smiled as we drove off into the sunset. Sunday morning we had crêpes for breakfast. I use Julia Child's master recipe and as I stated before , why mess with perfection. The girls enjoyed theirs with Nutella and I had mine with a homemade fig honey jam. If any crêpes remain, and they rarely do, place a barely damp kitchen towel over them and leave out to be enjoyed all day long. Bon Appetit!! Add milk and water to flour in a medium bowl and whisk until smooth. Pour batter through a sieve to remove any lumps. Add the eggs, salt and 3 tablespoons melted butter and whisk until well incorporated and smooth. This can also be done in a blender. Let rest for 10 minutes or longer in the refrigerator if not using immediately. Heat a crêpe pan or medium sized saute pan over medium heat. Brush with additional melted butter. Pour in 2 to 3 tablespoons of batter into the center of the pan and then tilt the pan in all directions to cover the bottom evenly. Cook about 1 minute, or until browned on the bottom. Turn and cook briefly on the other side. Cool on a rack or plate, placing each new one on top of the last, as you continue to cook the rest. Eat immediately or place in an air tight container and refrigerate for up to two days. Cut figs into quarters, or roughly chop and place in large saute pan with water, honey and sugar. Let sit for 20 minutes. Place pan over medium high heat and bring liquid to a boil. Lower heat to a simmer and cook for 45 minutes. Stir often and watch so honey and sugar do not burn. The figs will start to breakdown but you can also mash them occasionally with a potato masher or a whisk. Add lemon juice and zest and cook for an additional 5 minutes until liquid is gone. remove from heat and allow to cool before placing in jar. Refrigerate when cool. lasts about 3 weeks.